Want to save time by having your form field choices automatically created and updated for you? 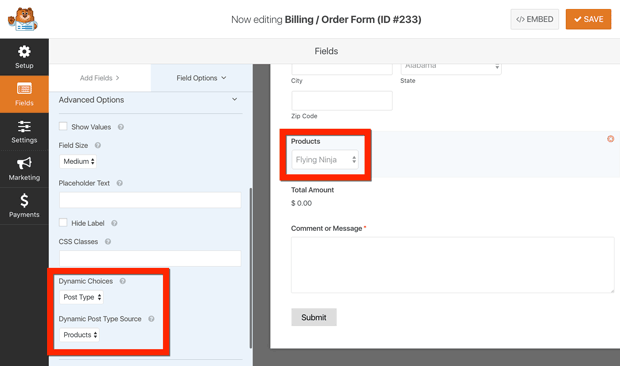 WPForms makes it easy to include fields based on post-types or taxonomy. In this article, we’ll show you how to do that by creating dynamic field choices. 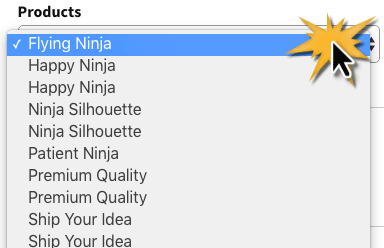 Existing posts, pages, tags, and categories can provide valuable information for form submissions, allowing you to dynamically populate dropdowns, multiple choice, or checkbox fields. You can easily ask users to select the appropriate option, without having to input it manually. Ecommerce – If you have products listed in WooCommerce or other ecommerce, you can ask users to specify the item in question. Real Estate – Users can submit a form with a question about a particular property or related to a specific agent. Services – It will be more efficient for you when customers clarify which services are requested. Frontend Post Submissions – Allow visitors to select from your blog post categories when submitting a post. Now we’re ready to add a dynamic field choice! Go to your form fields. Add a dropdown, multiple, or checkbox choice field and then click on it in the preview panel at right. In the Field Options panel at left, under Advanced Options, select the Dynamic Choice option. At this time, you can choose between a Post Type (Posts, Pages, or Custom Post Types) and Taxonomy (Categories or Tags). In our example, we’re choosing the Custom Post Type of Products. When you view this form, all published products will be viewable. Users can select which item they are referring to in their form inquiry. Now you’re all set! You’ve create a form with dynamic fields auto-populated with data from existing content within your website. Now, whenever your post type or taxonomies are updated, the form will be automatically updated along with them. We hope this tutorial helped you create dynamic field choices in WordPress. You might also want to check out our guide on How to Create a Contact Form Popup in WordPress. Hi, I wondered if it’s possible to set the post submission category as a default (so each submission auto categorizes, and the post will only show in sections filtered to that category). I’ve tried using the dynamic options, but you can’t select a default answer. I’ve also tried using a hidden field with a default setting and linking this through the Meta section on the Post Submission settings form. This way keeps coming back as uncategorized. We don’t currently have an option for this, but I do agree it would be super useful. I’ve noted this in a feature request so that our team can consider adding an admin-determined category option for post submissions in the future. In case it helps in the meantime, you might consider modifying your site’s default post category. This is set to ‘Uncategorized’ when WordPress is installed, but can be changed to any category (under Settings > Writing — here’s a screenshot). I apologize that this isn’t an ideal workaround, but I hope this helps! is it possible to use chained dynamic field with wpform ? Can you provide some more details or describe what you are envisioning? I’m looking to have the drop-down preselected to a choice based on a unique link. I want my users to press a “select” button under an image, then they are brought to the form at the bottom of the page with which ever choice they selected prefilled in the drop down. I already have the anchor figured out, now I just need to get the form to auto-populate their choice. I have a custom post type, with data in it. My CPT isn’t showing up. Hi, is it possible to pull usernames and/or email address in WP Forms from a SQL database? I’m looking for an easier way to import data than manually typing in over 300 employees.